• Romania’s modern retail stock amounts 3.56 million sq. m at the end of June 2017. 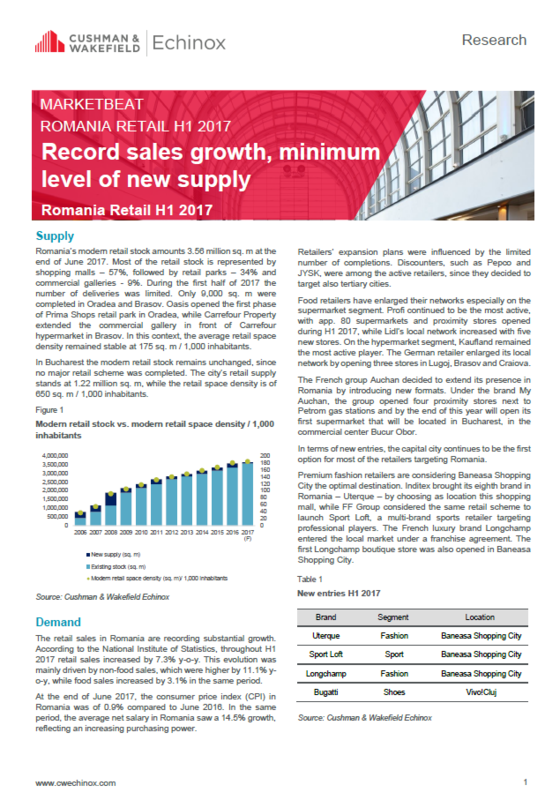 • In Bucharest, the modern retail stock remains unchanged, since no major retail scheme was completed. The city’s retail supply stands at 1.22 million sq. m, while the retail space density is of 650 sq. m / 1,000 inhabitants. • At the end of June 2017, the consumer price index (CPI) in Romania was of 0.9% compared to June 2016. In the same period, the average net salary in Romania saw a 14.5% growth, reflecting an increasing purchasing power. • In the second semester of 2017 approximately 60,000 sq. m of new retail spaces are scheduled for completion mainly outside Bucharest, in cities such as in Ramnicu Valcea, Galati, and Oradea.